Electricity supply across South Africa is the task of the national government, but local municipalities are responsible for the last leg of energy distribution and sale. Two out of three South Africans now live in cities. This means that local government is key to meeting the daily energy needs of the majority of our citizens. Many cities in South Africa use a Robin Hood approach to tackling the challenge of bringing free or affordable basic electricity and water services to poorer urban communities: they take from the rich and give to the poor. Cities use tiered pricing structures, charging higher tariffs for large-volume consumers, and using this revenue to cross-subsidize the free or cheaper basic services they are responsible for delivering to lower-income households. Not only does the revenue earned from the middle-class and businesses help address a city’s development obligations for poorer neighborhoods, but it also means the city’s basic income is dependent on selling as much electricity and water as it can. This puts cities in a bind: they need to put policies and technologies in place that reduce their region’s carbon emissions; and they need to encourage water savings to better manage this over-stretched resource. But they also need to keep their coffers full. This is one of the main reason they’re reluctant to push for lower energy or water-use behaviour amongst consumers. This municipal funding model comes into the spotlight in South Africa again as the country – the biggest carbon emitter on the continent – put a significant piece of legislation forward for public comment last month: the national Climate Change Bill. South Africa has various domestic policies that indicate the country’s willingness to join the global effort to cut emissions. At Copenhagen, we signalled to the international community our willingness to have our emissions ‘peak, plateau, and decline’, and by when. Our National Development Plan affirms our intention to reduce emissions below a baseline of 34 percent by 2020, and by 42 percent by 2025. From 2035, emissions need to start dropping. What the country has lacked until now is a clear direction of which institutional need to implement these policies, and how. The Climate Change Bill is an attempt to put that in place, by assigning the right government bodies to the task. How good the bill is, in its current draft form, depends on who you speaks to, although the nitty-gritty isn’t really relevant to this column. So how will the Climate Change Bill impact municipalities and their role in SA’s development agenda? The National Planning Commission (NPC) is developing a consensus of what a ‘just transition’ means for this country, through a series of stakeholder dialogues with different tiers of government, along with business, civil society and labour unions. Belynda Petrie is chief executive officer with OneWorld Sustainable Developments, which, with Sustainable Energy Africa, is overseeing the social partner dialogue process for the NPC. She says it’s too early to give any ‘headline’ messages from the workshops they’ve held so far. But there’s clearly a growing awareness that there needs to be ‘systemic change of the energy sector in South Africa’, if we want to decarbonise the energy grid, which is the basis of the economy. ‘At the moment, our grid is a vertically-integrated, centralised system,’ she explains. 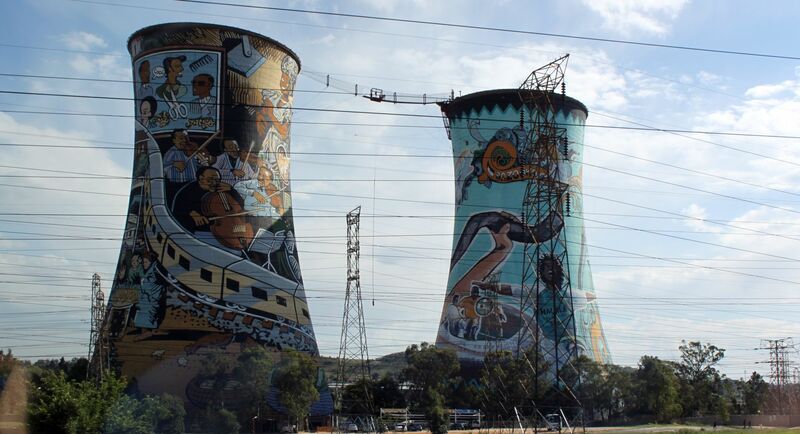 Eskom, South Africa’s national utility, has the monopoly on electricity provision in the country. It is the main generator, transmitter, and distributor of the country’s power. ‘The question from stakeholders is how do we restructure the sector to be decentralised,’ Petrie says. One approach could be for the utility, Eskom, to outsource much of the electricity generation to private companies, and free itself up to play more of a developmental, oversight role. It would be responsible for keeping track of global trends and coordinating other institutions, laws, and infrastructure decisions within the energy system. This could also involve supporting other institutions or firms that are responsible for generating or distributing power. Municipalities are key. One alternative to the current municipal revenue model is for local governments to earn their income from the distribution of electricity, rather than the sale of the energy itself. Users would pay for the grid infrastructure along which the electricity flows, rather than for the energy coming out the plug at the end of the grid. ‘If Eskom took an oversight role, it would then need to support local municipalities in this, and help change the laws that currently govern how municipalities are required to deliver on services,’ explains Petrie. Meanwhile the results of the NPC’s stakeholder dialogue process to map this ‘just transition’ roadmap will likely be presented at a summit in April 2019. ‘There’s still a lot of consideration to be given around what municipalities can and can’t do, as governance structures, and how this will allow for a low carbon, climate resilient economy,’ says Petrie. The outcome won’t be something legally binding, but will take the shape of a social compact.